Yeah it comes with a single stock, all I did was run some new piping from the Y pipe where it was broken off and I installed a cherry bomb turbo muffler ( paid $30 for it ). I'm going to fix it properly over the winter probally, and I'm going to go with shorty headers and a X pipe probally with some flow masters. If you want a nice rummbling exhaust thats sounds beefy buy the H pipe. You might not be happy with the X pipe, X pipe is kinda loud and its more of a annoying sound cause its a constant same sound it never changes It just goes louder and quiter, but with H pipe, there is some popping and other cool sounds it changes all the time and sounds amazing. That is my thery on the differents on X and H pipe, different people will tell you there thery on HP and all the other info. Thanks for the advice, I wouldnt want a loud annoying exhaust. I'm looking for more of a rumbling exhaust. :5: I care about power but I dont want to sound like a ricer. A guy I know is selling a 93 5.0 motor with transmission low ks for $500 could I swap this motor into my car?? A 5.0 would be awesome to swap in, especially now before I paint. 5.0 has so much more potential!! Its for sure going to get painted this winter i'm thinking the same red colour or I might change it just a little bit to this Cranberry Kandy Apple colour my friends Jetta is. I know it's really your choice what colour you paint the car, but that's kinda a girly/ricey colour IMO, no offence, just my opinion. 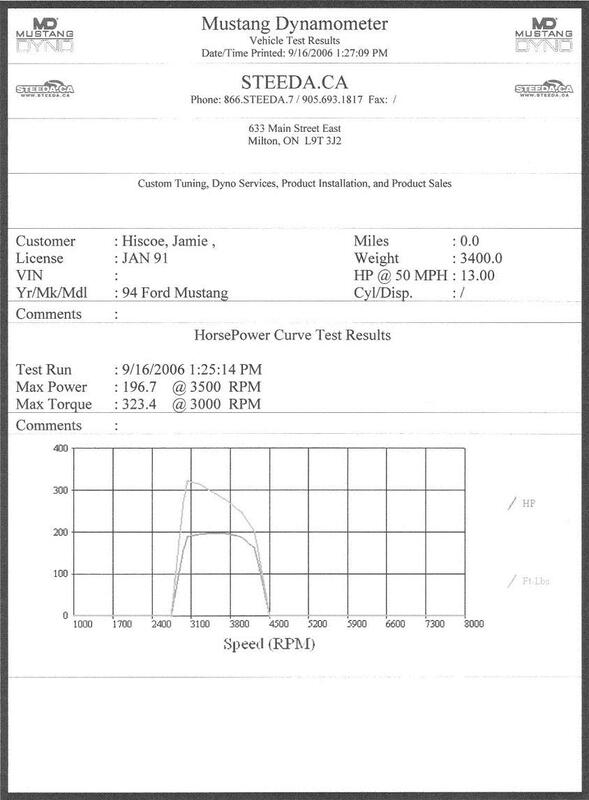 I have a basically bone stock Thunderbird Supercoupe V6 in my 94 stang and still have the stock rear end and ran a 14.04 at the trtack, high 13's are possible on this stock motor, with my new 8.8 rear end and 373 gears I will hit mid to low 13's ona stock V6 motor. Its a Supercharged V6 but stock from FORD, I just bolted the blower and brackets onto the stang bottom end too, so for a few hundred you can get all the needed parts, then get fuel pump/injectors/and a tune and your set. That seems to sound like a good idea, so is it your stock v6 with the supercharger from a s/c on it or is the s/c motor in your car? right now its the SC blower on a mustang bottom end, until I get the SC bottom end rebuilt. I got dyno'd today and made 196 RWHP and 323 RWTQ the motor is stock other then 10% blower pulley and aluminum jackshaft and aluminum underdrive pullies. I do have 42# injectors but the stock 30#er's from the SC will work fine, stock mustang MAF as well. Now that my tuner has a file that works with my car he can use it on other SC powered cars with the same setup, he has tuned many Supercoupe motors in mustangs now. If you go that way let me know I can do the install for you. Those are definately some respectable #'s .. Alot of torque .. Definately something I will consider! Mind if I ask how much you spent on this setup so far?? How many km's did your car have on it when you installed the blower on it..? not sure on how much I have spent its been 8 years I have been working on my car, but the current setup let me try and break it down. thats about all you need for the swap, I have other parts as well but essentially thats all you need. Doesnt seem like this is that expensive to do, and definately worth the money as a power adder.. I am definately considering doing this now, thanks for telling me about it. My motor would definately need some love before I do this though, I dont think it'll last too long with 326,000 on it and a blower. anyone here selling or know of a good place to find a motor ??? Last edited by 94STANGR; 09-17-2006 at 11:24 AM.